Bangkok -- Twenty-six bodies exhumed at a mass grave in southern Thailand near a camp with suspected links to human trafficking bear no signs of violent death, police said on Sunday, following initial forensic examinations at the site. 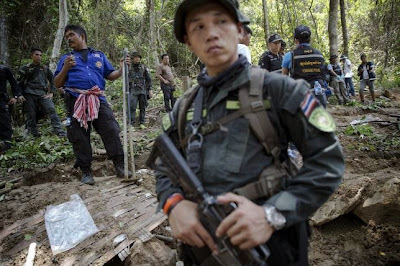 Dozens of police and rescue volunteers trekked into the mountains on Saturday to the jungle camp in Songkhla province and dug up 21 bodies. Five bodies were retrieved on Friday from the camp, which is a few hundred metres from Thailand's border with Malaysia, bringing the total to 26. "From initial forensic investigation at the site there are no marks on the bones or breakages that would suggest a violent death," Police Colonel Triwit Sriprapa, deputy commander of Songkhla Provincial Police, told Reuters. "It is likely that they died from disease and malnutrition." The discovery of the camp was a sharp reminder of the extent of human trafficking in Thailand and comes as the Southeast Asian country makes efforts to improve its record in fighting the trade. Illegal migrants, many Rohingya Muslims from western Myanmar and Bangladesh, brave often perilous journeys by sea to escape religious and ethnic persecution and to seek jobs in Malaysia and Thailand. Prime Minister Prayuth Chan-ocha called for the "severest punishment" for those found to be involved in the illegal trade. "Anyone involved in human trafficking will receive the severest punishment no matter what their position," said Colonel Sansern Kaewkamnerd, deputy government spokesman. Police are focusing their investigation on a trafficking network linked to the camp, said Police Colonel Anuchon Chamat, deputy commander of Nakorn Si Thammarat Provincial Police. "We have reason to believe that one suspect arrested in Nakorn Si Thammarat and his associates was directly linked to this camp," Anuchon said. Three survivors including two teenagers were found near the camp. Police do not expect to find further bodies at the site, Triwit said. "A witness said 30-40 people were brought to the camp at a time. The camp could have held up to 200 people," Triwit said. The government said on Saturday it was determined to rid the country of human trafficking. The prime minister has acknowledged the complicity of some Thai authorities in smuggling people. Last year, Thailand was downgraded to the U.S. State Department's lowest category - or Tier 3 - in its annual Trafficking in Persons Report, which assesses how governments around the world have performed in fighting human trafficking.